A sneak preview of the Niobids' resident doctor, who will be returning in Chapter 17. Now let's talk about schedules. TL;DR: I need to redesign my pipeline to improve production speed and quality. I have no ETA for Chapter 17, apart from ASAP. There will be regular bonus pages and progress updates in the meantime. I haven't been happy with the relaunch of CD so far. I set high standards for myself, and I've been struggling to meet them. Most of my problems have been caused by technical issues related to the new character rig that I built in Cinema 4D. While it has improved many aspects of production, I keep encountering new problems that force me to compromise artistically. I've come to the conclusion that my dream of using a single universal rig to control all characters is impractical, and I need to custom rig each character separately to give me the power I need to tell the story that I want to tell. This entails a lot of work, but I'm currently investigating ways to speed the process using scripts, thereby automating large chunks of the rigging process. 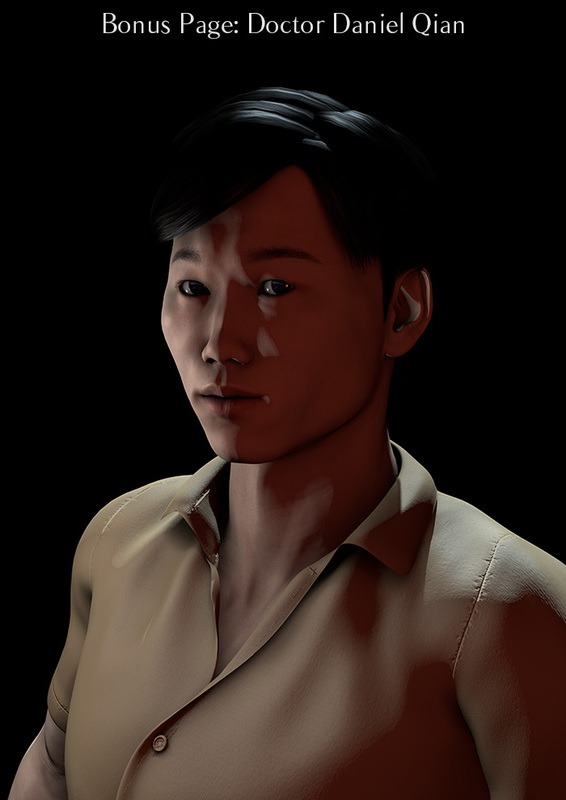 Today's test render of Daniel uses the prototype of the new rig system. This means I need to stall production for a short time in order to improve production in the future. I'm reluctant to give a date for Chapter 17 just yet, because I'm still in the R&D phase, but I'll be very disappointed if it takes more than a couple of weeks. In the meantime, I will continue to post bonus pages, and I'll keep you informed of my progress. I have a story to tell, and I can't wait to tell it.